Week 6: Radio and Television. What was your favorite radio or television show from your childhood? What was the program about and who was in it? When I was still at primary school, my parents used to give me Dad's "wireless" radio to listen to on Sunday mornings. My "treat" was that I was allowed to lie in bed and listen to the morning stories. Stories such as Molly Woppy, Sparky and the Talking Train, Diana and the Golden Apple, Little Toot, and songs such as Flick the Fire Engine etc. I thought it was a fabulous treat . . . of course it was a ploy to keep me in bed longer! And it worked! TV: I was a big Doctor Who fan growing up. "My" Doctor was Jon Pertwee. The Daleks and the Cybernauts were my favourite baddies. I used to hide behind the couch when they came on (as nearly ever child my age did no doubt). I remember being given a toy Dalek, which another child broke (I never broke my own toys, others always did it for me). It was never quite the same for me when Tom Baker took over. I also loved Follyfoot Farm. I love all animals, and I was a huge horse fan. Used to spend hours drawing horses. Reading horse books. Watching any programmes that had horses in it. I also loved Lassie (dogs), Daktari (lions), Flipper (dolphins), and Skippy (the bush kangaroo). I rarely missed an episode of the Tomorrow People. They use to "jaunt" everywhere - hold on to their belts and disappear from one place and reappear in another. I remember the shaggy 70s haircuts and bell bottom. Star Trek, Space 1999 were also huge. Not sure if I was a SciFi fan as such, or if it was just people had such a fascination with space due to the Moon landings, that those are the programmes that were made. Interestingly, my husband's father was an electrician who did "special effects" on Space 1999, (he also did Alien - which is another story). Then there was an Australian convict drama I used to love called Against the Wind, it starred Jon English and he also sung the theme song "Six Ribbons". I was a teen then, and had a wee crush on Jon. Loved his moody eyes etc. Wow - walk down memory street or what? 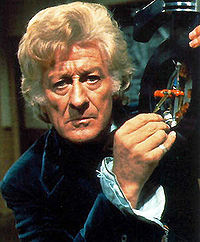 "My" Doctor was Tom Baker, but I did catch a few of the Jon Pertwee episodes (love the pic of him here). My daughters watch the modern set of Doctors; my favorite among that group was Christopher Eccleston.